Hello and welcome back to another Silver Lining. The purpose of this column is to provide new SolForge players with some viable deck options that rely solely on the forging system to put together. No actual money required. This article will use a budget of 94,000 silver for its decklists, which is the starting 10,000 plus around 4,000 a day from getting all your daily rewards (three wins a day, online or offline) for three weeks. The decks in these articles may not be able to thrive in the tournament queues, but they can hold their own in the random queues to win rewards while you build up your collection. When you first start playing, I highly recommend reading Making the Most of the Starter Decks for ideas on decks you can build right off the bat with your starting collection. That will hold you over while you save up silver for those first few weeks. I highly recommend you use any tickets you receive for drafting, as drafting is an excellent way to quickly build up your collection, even if you don’t win the draft. This week’s deck is built around Dr. Frankenbaum and his abominations. It is a mono-Nekrium build that wants to be aggressive, but can win a longer game too. The goal is to play lots of solid creatures that happen to be abominations to take advantage of the extra damage provided by the good doctor. 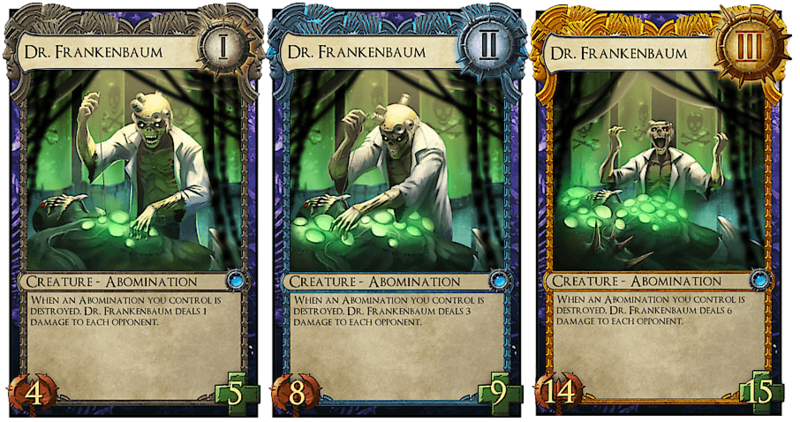 Dr. Frankenbaum: The centerpiece of the deck, the doctor ensures your abominations take some of your opponent’s health with them, even if they are trading evenly. Late in the game it can create a surprisingly fast clock for your opponent and help swing races in your favor. Graveborn Glutton: Can trade evenly with most creatures at every level, is an abomination, and can push extra damage through even if it dies. You’ll be surprised how many games you’ll win by forcing your opponent to kill a Glutton, dealing the last handful of damage. Hellforged Avatar / Xithian Rotfiend: Excellent abomination underdrops, or on-level plays if you’re feeling extra aggressive. Darkshaper Savant: The only non-abomination creature in the deck, the board control and card value Savant can provide make it a worthwhile inclusion anyway. Having a Savant on the board turns otherwise abysmal all under-leveled hands into decent ones, and can turn even trades into positive ones to get extra value from your other creatures. Xithian Crusher / Gloomfiend: Abominations that have reasonable bodies. You don’t need to go out of your way to play them over your more flashy cards, but they can get the job done in a pinch. Group Meal: Combat tricks are fun. Using Group Meal when your opponent has set up even trades to turn them into favorable trades for you can devastate your opponent’s board, and leave you with several high attack creatures that they need to deal with. Vyric’s Embrace / Cull the Weak: Every deck needs some amount of removal because even the most powerful plans don’t always work exactly as intended all the time. Removal lets you counter your opponent’s threats while you piece you plan back together. Both of these particular spells have many relevant targets against popular decks. Charnel Titan: A great follow up to Vyric’s Embrace or Group Meal, Titan can be the biggest creature on the board. Also is a great response to opposing Thundersaurs and Battle Techs. This deck wants to play a game of attrition, making even trades, and gaining incremental value wherever possible through the Doctor’s triggers. During PL1, prioritize playing Frankenbaums or Gluttons if you have the chance to do so without falling too far behind. Try to make at least even trades. If you can attack and poke through extra damage, that’s great. If not, don’t worry; there will be time later. Once PL2 rolls around its time to go on the offensive. Look for favorable trades. Open lane your large creatures and force your opponent to deal with them, usually taking damage off of Doctor triggers in the process. Try to keep your Doctors alive, so you can whittle even more of your opponent’s health away. By PL3 your opponent should ideally be down to 20-40 health. Your L3 Doctors are fantastic here, forcing your opponent to choose between taking damage from your creatures’ attacks, or blocking and taking damage from the Doctor. As their health plummets, this choice will become increasingly difficult, and one or two misplays should eventually seal their fate. If at any point in the game you fall very far behind, try to claw your way back into the game through favorable trades, and extra damage from death triggers. This deck is fairly good at coming back because even when losing you’ll be chipping away at their health here and there making it easier to win once you’ve caught back up on board. Once your collection and silver supply grows, here are some cards to look out for to improve this deck. Hellforged Avatar: The budget constraints of this article keep me from including a third Avatar, but one more would certainly improve the deck. Fleshfiend: Leaving a body behind after a trade will help you get ahead on board. Also provides extra Frankenbaum triggers. Epidemic: A three-of in most competitive Nekrium decks, it always leads to value. Hopefully this article was helpful. If you have any questions or feedback, feel free to PM me, MyrMaster, in the SolForgeGame.com forums or leave a comment below. Also, feel free to challenge me online or to submit a budget deck idea for a future column. See you next time. When you can afford a legendary (or get lucky enough to crack it in a pack), Woebringer also makes an excellent addition to this deck. Is there a possible replacement for Hellforged Avatar? I don’t think there is a replacement that fills the exact same role, but fleshfiend is another powerful heroic abomination that fits nicely with the theme of the deck. I even prefer the Fleshfiend, I think. Although the Avatar regenerates, it caps at 15/15 if you’re playing the L3 from a full hand. My experience is that the L1 is good in PL1 and PL2, but the upper level versions struggle to keep pace. YMMV. I also tried Bonescythe Reaverx3 instead of Xithian Crusherx3 and it works great. But what would you -1 to putt x1 more Hellforged Avatar? Hi i kinda like this deck could you tell me which cards could be good to upgrade this deck?